Smt. Nirmala Sitharaman, Hon’ble Minister of State (Independent Charge) for Commerce & Industry, Govt. of India will inaugurate Golden Jubilee celebration & Award Function of FIEO to be held at Le Royal Meridian, Chennai on 8th October 2016. Federation of Indian Export Organisations (FIEO) set up by Ministry of Commerce, Govt of India will be organizing Golden Jubilee celebrations along with Regional Export Awards at Chennai on 8th October 2016 at 6.00 p.m. in order to highlight its contribution for developing export from India. 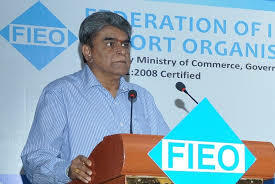 According to Dr. A. Sakthivel, Regional Chairman-FIEO, the organisation contributes 72% of Southern Region exports. Southern Region contributes 23% of national exports with US$ 60.13 billion worth of export during the year 2015-16. The region become second largest region contributing exports with wide range of products starting from aircraft to handicraft products. FIEO is preparing strategy to make Southern Region top contributor in forex earning with the support of all Southern Region State Governments who are very pro-active in helping exporters, Dr. Sakthivel said.